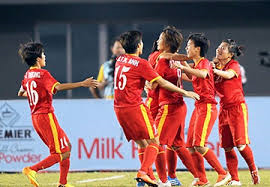 common sports played in Vietnam are soccer, volleyball, and basketball, football, badminton, taekwondo, swimming, tennis, and ping-pong. Most children are taught some form of self-defense at a young age. People in Vietnam enjoy playing chess and many complete In fierce matches with other appoints in as a team sport. Watching soccer during the world cup is a common for many families in Vietnam. "Flag of Vietnam." Image. CultureGrams Online Edition. ProQuest, 2015. Web. 14 May 2015. Map of Vietnam. Digital image. CultureGrams Online Edition. ProQuest, 2015. Web. 17 May 2015. "Vietnam." Britannica School. Encyclopædia Britannica, Inc., 2015. Web. 14 May. 2015. "Vietnam." Central Intelligence Agency. Central Intelligence Agency. Web. 08 May 2015. "Vietnam." CultureGrams Online Edition. ProQuest, 2015. Web. 13 May 2015.